County Down is a former county of Northern Ireland and borders County Armagh, County Louth, County Antrim and the inlet of Belfast Lough. The county rests simultaneously on the southernmost point of Northern Ireland and the easternmost point of Ireland. The county gets its name from the Irish word dún which translates to a fort. The fort that generated this name once stood in the historic town of Downpatrick. Relics left over from the prehistoric era are seen in the Giants Ring and the underground chamber near Newcastle. The county was the centre of violent Protestant demonstrations against the Catholic King James II. The locals went on to meet the Irish Army at the Break of Dromore however the protestant forces were defeated, and the entire county of Down fell under the leadership of Jacobinism. The bath houses and wells of St Patrick’s first monastic school are well-preserved and open for viewing at Struell. County Down contains a variety of attractions for visitors. Many castles dot the eastern sections of the county, and the diverse landscape provides ample reasons to enjoy a beautiful walk in the famed Mourne Mountains, take up an hour or more of bird spotting Strangford Lough or dip into the extensive farmland and cosy pubs! I am SeaSpray, hire me today! Volkswagen Devon Campers were conversions of Volkswagen Type 2 (better known as Transporter or Micro-Bus) vehicles in the early 1950s through 2003. Volkswagen subcontracted the modifications to Westfalia-werke (most often called Westfalia) in Rheda-Wiedenbr?ck. Various models and options were available. 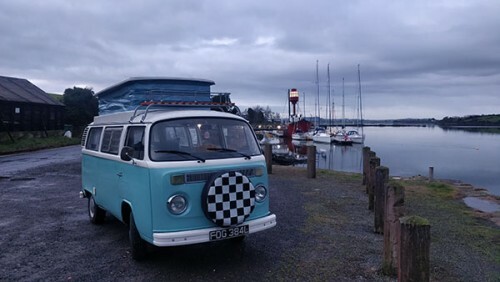 VW T25 Autosleeper High Top. Also known as the Brick or the wedge. Beautiful little 5 berth Eldis motorhome. Very clean with toilet,shower,gas heating and hot and cold water. Double bed above cab,double bed at dinning area and single for child at bench seat.